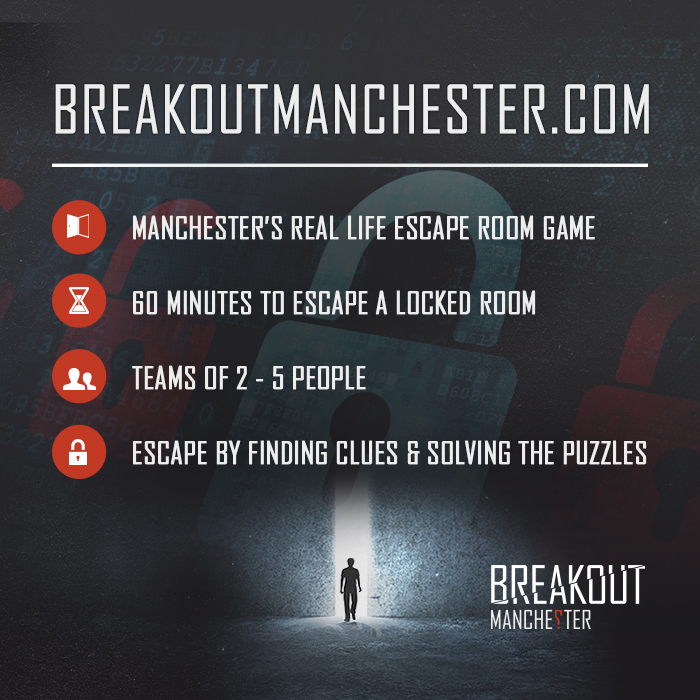 We are Breakout Manchester, we are a live room escape game situated in Central Manchester. We challenge members of the public to be locked in one of our puzzle rooms for 60 minutes while they attempt to escape. With the clock ticking down rapidly the challengers search franticly to find clues and solve puzzles to hopefully piece together all the elements they need to Breakout. Opening to the public on May 27th 2014 we launched with just our John Monroe Detective Office in which players raced to solve the murder of John Monroe and prove their own innocence. Our second room opened on June 6th 2014, branded Virus for its scientifically themed challenge where players watched their time run out while trying to save the world from a Viral outbreak. Since this date we have now expanded our once small centre to be able to contain a whopping 5 games. Each one of our rooms contains its own theme and difficulty of challenges appealing to all that play. A second Breakout centre, which is situated in Manchester’s Great Northern, was launched on January 31st 2015, the games their make up our twin 6th and 7th rooms in which players are set an exam to complete their final stages of secret agent training. Since our two sites have launched we have been challenging all of Manchester to escape the clutches of our puzzle rooms, and have recently branched out west to challenge the citizens of Liverpool to attempt to Breakout.